I’ve seen a lot of talk recently about how strong underdogs have been early in this NFL season. Of most interest from a betting perspective have been the start that home underdogs have gotten off to. There has been a road favorite in 19 games through the first three weeks of the regular season. In 13 of those games the road dog has covered the spread. Even more impressively, 12 of those 13 underdogs have won outright. For moneyline bettors that means a serious payday. It really has been a good start for home underdogs through three weeks, and lots of people are making a big deal of it. Here’s the important thing to remember, though — this isn’t a new or unique thing. In fact, it’s to be expected. Last year home underdogs were 13-3 ATS through the first three weeks. The year before they were 12-7 ATS. Over those nine combined weeks only one week hasn’t been profitable betting home dogs, and that was when they went 4-4 ATS in Week 3 of 2010. That is, after all, why they are called public teams. The public will be drawn towards the higher-profile, more popular teams at the best of times. They will especially be drawn early in the season when there isn’t current information to rely on. Public bettors don’t do a lot of homework, so they rely on the teams they like and the opinions that are long-held. When they loyally back those teams their odds get inflated and, when they are playing on the road, the home team can get less respect than it deserves. There have been a whole lot of upsets by home underdogs so far this year, but there haven’t been any overwhelming ones. 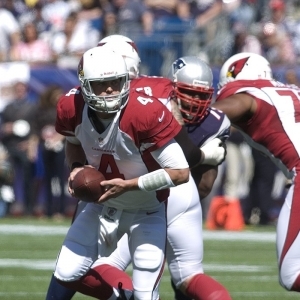 The biggest loss of the year, New England’s stunner against Arizona, happened in New England. So did New Orleans’ shocking opening loss to Washington. The biggest upset by a home dog belongs to Minnesota over San Francisco. Few saw that one coming, but San Francisco was still only favored by 6.5. Games with spreads of less than a touchdown can, and often do, turn out any number of ways. This would be a much more noteworthy story if there had been a number of huge upsets among the 13-6 ATS record. The public loves season previews and training camp diaries — that’s why we are bombarded by so many of them at the start of every NFL season. By their nature, though, most of them are very superficial — especially the ones in major mainstream media outlets. They will focus on the headlines, the superstars and the obvious stories, and they will avoid the more complex and less interesting but significant storylines. When the public is using those to make their betting decisions they will inevitably be misled and misdirected early in the season. In the offseason players move teams, retire, get drafted, change positions, return from injury, and so on. That means that every team has made at least some adjustments to their starting lineups, and in many cases they have made very significant changes. On top of that, head coach changes in large number, and coordinator changes are even more frequent. Given all that it is impossible to really know anything about teams until we have seen them play a few times. We can study, analyze and extrapolate all we want but really all it will be is a guess. Given that, it’s not a wonder that the chosen favorite isn’t always the right one — especially when the two teams are relatively close and one team is playing at home. Oddsmakers are in business to make money, and they are, for the most part, very good at it. they always have been good, and their abilities have sharpened in the computer age because of the information — about teams and bettors — that is available to them. They know how bettors are likely to respond to given situations, and they do their best to shape the lines to maximize their advantage. This is easier in the early part of the season than at any other point.